Months of preparation come down to this final day. 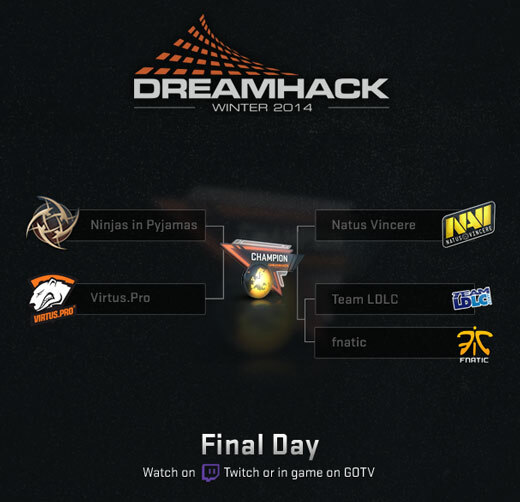 We’re down to our last teams, but only one can emerge the champion of The 2014 DreamHack CS:GO Championship! The Semifinals start at 1:00pm CET (7:00am EST, 4:00am PST), followed by the Grand Finals at 9:00pm CET (3:00pm EST, 12:00pm PST). Watch the matches on GOTV, or on twitch.tv with a linked Steam account and you’ll have a chance to receive a souvenir package commemorating the event. You can also support your favorite team by purchasing team stickers or the Legends sticker capsule.